Essential Fatty Acids - The one supplement most people need! A balanced source of these healthy fats in ideal ratios for the human body. 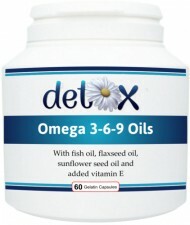 Derived from sunflower seed oil, flaxseed oil and fish oil - the best source. Omega oils are required by the body to carry out a number of vital mental and physical functions. Many of these fatty acids are also ‘essential’, meaning that they cannot be produced by the body but are required on a daily basis. As such, they must be obtained from the diet. The high-strength (1000mg), high quality oils in this product are in an easy-to-swallow gel capsule form. 1 - 2 capsules per day with food or without food. Not to be used by those suffering from epilepsy.